A tile overlay, sometimes called a tile layer, is a collection of images that are displayed on top of the base map tiles. A TileOverlay defines a set of images that are added on top of the base map tiles. You need to provide the tiles for each zoom level that you want to support. If you have enough tiles at multiple zoom levels, you can supplement Google's map data for the entire map. Tile overlays are useful when you want to add extensive imagery to the map, typically covering large geographical areas. In contrast, ground overlays are useful when you wish to fix a single image at one area on the map. You can also use transparent tile overlays to add extra features to the map, by setting a transparency factor on the tile overlay programmatically or by providing transparent tile images. The Google Maps API breaks up the imagery at each zoom level into a set of square map tiles arranged in a grid. When a map moves to a new location, or to a new zoom level, the Maps API determines which tiles are needed and translates that information into a set of tiles to retrieve. 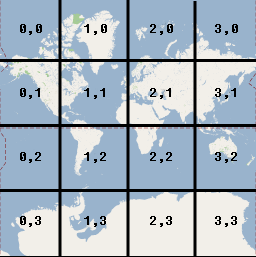 The tile with coordinates (0,0) is always at the northwest corner of the map, with x values increasing from west to east and y values increasing from north to south. Tiles are indexed using x,y coordinates from that origin. At zoom level 0, the entire world is rendered in a single tile. Each zoom level increases the magnification by a factor of two. So, at zoom level 1 the map will be rendered as a 2x2 grid of tiles. At zoom level 2, it's a 4x4 grid. At zoom level 3, it's an 8x8 grid, and so on. When creating images for a tile layer, you will need to create an image for each tile at each zoom level that you wish to support. Google Maps targets 256 dp (device-independent pixels) when displaying tiles. For high resolution devices, it is recommended that you return high dpi tiles (512x512 px). Refer to the Android Developers documentation for information on supporting different screen sizes and densities. Note: The zoom levels supported by the camera depend on various factors, and are not related to the zoom levels that your tiles will support. GoogleMap.getMaxZoomLevel() returns the maximum zoom level available at the current camera position. This takes into account the map type currently being used. For example, a satellite or terrain map may have a lower maximum zoom level than the base map tiles. GoogleMap.getMinZoomLevel() returns the minimum zoom level, which is the same for every location (unlike the maximum zoom level) but may vary between devices and map sizes. The simplest and most common way of creating a tile overlay is to provide a URL pointing to the relevant tile image. UrlTileProvider is a partial implementation of TileProvider that provides image tiles based on a URL. This class requires that all the images have the same dimensions. You will need to implement UrlTileProvider.getTileUrl(), which accepts the tile coordinates (x, y, zoom), and returns a URL pointing to the image to be used for the tile. The method should return null if there is no tile for the given x, y and zoom. A URL can point to a web resource, an Android asset, or a file on the local disk. Define a UrlTileProvider to supply the tile images. Override getTileUrl() to construct the URL for each tile image. fadeIn: Boolean. Specifies whether the tiles should fade in. The default value is true. You may find it useful to turn off the fade-in when switching between tile overlays quickly. For information on the relationship between transparency and fade-in, see the section on transparency below. tileProvider: The TileProvider to use for this overlay. transparency: Float. Sets a transparency factor for tile images. The value must be in the range [0.0f, 1.0f] where 0.0f means fully opaque (default) and 1.0f means fully transparent. See the section on transparency below for a code sample and the relationship between transparency and fade-in. visible: Boolean. Specifies the visibility of the tile overlay. An invisible tile overlay (value false) is not drawn on the map, but retains all of its other properties. The default is true. zIndex: Determines the order in which the tile overlay will be drawn in relation to other overlays, including ground overlays , circles, polylines and polygons. Overlays with a higher z-index are drawn on top of those with lower z-indexes. The order of overlays with the same z-index is arbitrary. The default z-index is 0. Note that markers are always drawn above other overlays, regardless of the z-index of the other overlays. * Check that the tile server supports the requested x, y and zoom. * Complete this stub according to the tile range you support. * need to define the supported x, y range at each zoom level. To see an example of a UrlTileProvider in action, refer to the TileOverlayDemoActivity in the sample code that is bundled with the Google Play services SDK. Note: If you need more control, you can define a tile provider by implementing the TileProvider interface. It can be useful to overlay transparent tiles on the map, so that users can see the base map below the overlaid tiles. You can do this by providing your own transparent tiles, or by setting a transparency factor on the tile overlay programmatically. // Switch between 0.0f and 0.5f transparency. The transparency is implemented as an alpha channel multiplier for tile images. To set the transparency of a tile overlay, provide a TileOverlayOptions object with a transparency in the range [0.0f, 1.0f] as shown in the above sample. A value of 0.0f means the tile overlay is fully opaque and 1.0f means it's fully transparent. The default value is 0.0f (opaque). You can access the tile overlay's transparency by calling TileOverlay.getTransparency(), and you can change it by calling TileOverlay.setTransparency(). There is no animation when the transparency is changed. The transparency option operates alongside the fadeIn option. Fade-in provides animation of transparency upon tile loading. If you set a transparency value, the tiles fade in from fully transparent to the defined transparency value. If you change the transparency during fade-in, the animation continues toward the new target transparency. You can remove a tile overlay with the TileOverlay.remove() method. If the tiles provided by the tile overlay become 'stale', you can call clearTileCache() to force a refresh. This will cause all the tiles on this overlay to be reloaded. For example, if the tiles provided by the TileProvider change, you must call clearTileCache() afterwards to ensure that the previous tiles are no longer rendered.